CarGurus has 22,671 nationwide Challenger listings starting at $5,995. For 2017, all-wheel drive tones down the Challenger's muscle with milder manners. No car is more overtly retro than a Dodge Challenger. I wasn’t born in the sixties or seventies, and so I didn’t pack any buddies in the back to chase girls and do burnouts when gas was 25 cents a gallon—or whatever guys in their sixties and seventies say they did with muscle cars. Yet the moment I sink into the modern Challenger’s orangey-red seats, I’m disappointed Led Zeppelin isn’t performing tonight at Madison Square Garden. The Dodge Challenger represents fun and good times in the most traditional American sense (if you ignore that it’s built in Canada on a Mercedes platform from the DaimlerChrysler era). Which is to say, if you drive a Challenger, we know exactly how you feel about men who wear skinny suits without socks. Like the Jeep Wrangler, the Challenger wears its vintage clothing over modern technology and a valid warranty. From the driver’s seat, you can see the far edges of the hood. The trunk lid is pan-flat, and the tiny central cutout forces you to lift your grocery bags high over the bumper, not slide them. You might as well buy a mid-'90s two-door Bronco—that’s how large, wide, and imposing the Challenger is from any angle. It should all feel irrelevant and silly, yet the Challenger pulls the whole thing off, even if the seat fabric reminds me of a throwaway couch on someone’s driveway. It’s hot. Inside, retro gauges mix with modern screens and controls. The whole dash is a single piece of soft rubber and contrasts the wide, flat sheet metal on the outside with flowing curves and rounded corners. The modern Challenger has been restyled only once in its nine years—really, just to install this crafty interior and LED lights—and yet the car’s presence hasn’t faded. I have no connection to heavy American muscle cars, and I love it all the same. The major change for 2017 is the new GT trim we tested here. For the first time in this segment, the GT brings all-wheel drive (AWD) for buyers who don’t relish the tail-wagging antics of all other rear-wheel-drive (RWD) Challenger trims. 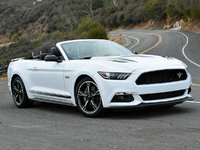 Paired exclusively with the 3.6-liter V6 and an 8-speed automatic, the GT can hustle its two-ton curb weight quickly enough, with 305 horsepower and 268 pound-feet of torque. A customizable sport mode alters the throttle, transmission, steering, traction control, and suspension settings; paddle shifters allow lazily timed downshifts. In GT trim, the Challenger is reduced to a cruising mobile. At highway speeds or around town, it’s incredibly silent and damped, with a smooth ride, light steering effort, and almost no voice from the V6. Step on it, and you’re greeted with the same pedantic growl as a Chrysler Pacifica and any other Fiat Chrysler product sharing this engine. That Dodge didn’t develop a special exhaust or program quicker, harder gear shifts is inexcusable. It’s not too hard to make a 6-cylinder engine sound better or feel faster than it is. The Chevrolet Camaro’s V6 can do that. In the Challenger GT, there’s such little exhilaration—and that's partly due to the all-season tires—that it stains the car’s boldface reputation. But what about the AWD? 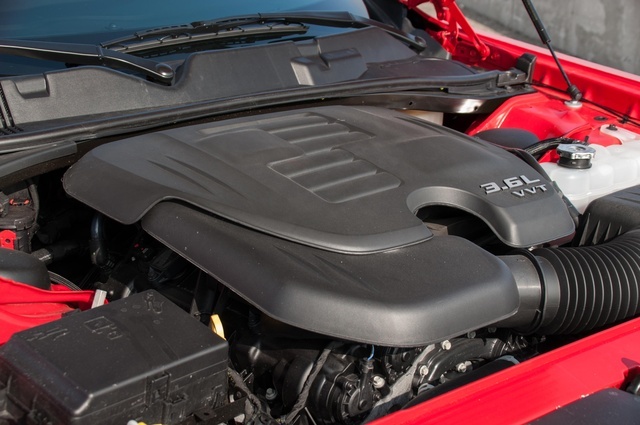 As with the Charger sedan, the Challenger GT uses a clutch pack to keep the front axle disengaged in most driving situations; it can route up to 38 percent of engine power to the front when necessary, but only after the rears begin to slip. On hard-crusted snow, the GT wasn’t a grip champ. Granted, it’ll pull out of an icy situation far better than a regular Challenger, but it can’t come close to what a Subaru or Audi can muster with permanent all-wheel drive. 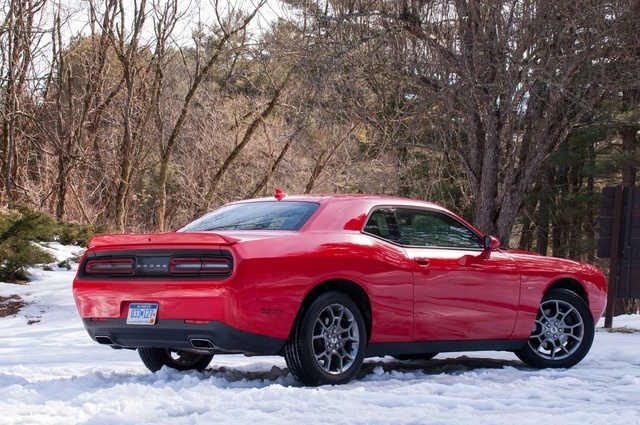 For the convenience of driving a Challenger year-round, the GT is still a good choice if you’re aware that AWD doesn’t turn it into a billy goat. You will have to swap the all-seasons for snow tires. Fuel economy is the GT’s strong suit. We recorded around 22 mpg over 500 miles. The EPA rates the GT at 18 mpg city and 27 mpg highway. 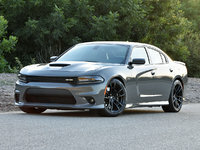 Of course, Dodge offers three thirstier V8s with incredible firepower and appropriate soundtracks: a 5.7-liter with 375 hp, a 6.4-liter with 485 hp, and on the Hellcat, a supercharged 6.2-liter with a stupendous 707 hp. A 6-speed manual gearbox is standard in all V8 versions; it's not available in any of the three V6 trims. While the Hellcat feels like an overdose of illegal drugs, the regular V8 models provide a healthy buzz. None of these cars handle well. All feel ponderous in parking lots. 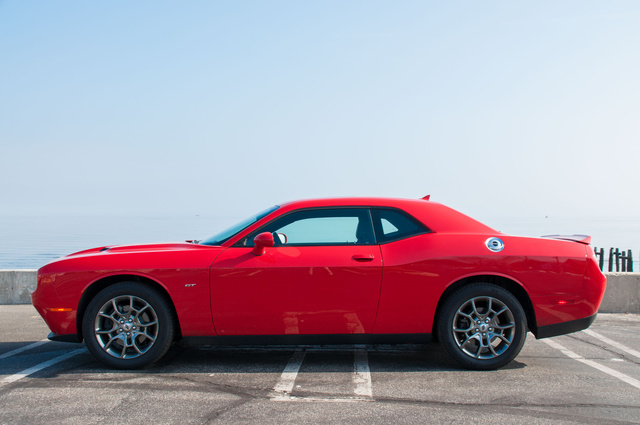 Go in a straight line and the Challenger will remind you of its true talent. Unlike the Camaro, in a Challenger you don’t feel like you’re deep inside a Sherman tank. There’s enough glass, even with that distinctive kink cutting off the rear windows, to easily see out of all four corners. The mirrors are small, but offer more surface area than those on a Camaro. Really, in all aspects, the Challenger has better visibility versus a Camaro, yet it’s considerably tougher to maneuver due to its exaggerated body size. A Mustang is superior in both aspects. But if you want a coupe with style as the top priority, you should be willing to overlook these shortcomings. Just be sure to slam the doors—they’re so long and heavy they won’t latch if you’re light-handed. The chunky seats aren’t as cushy as they appear, but they are supportive and relaxed for long drives. The rear bench looks like a livable space, until you attempt to squeeze a man back there. Legroom, not so much headroom, is the compromise here. If the front passenger moves up several inches, it can work for a short drive. Otherwise, even though there are three seatbelts, don’t attempt to put anyone there who can speak a full sentence. 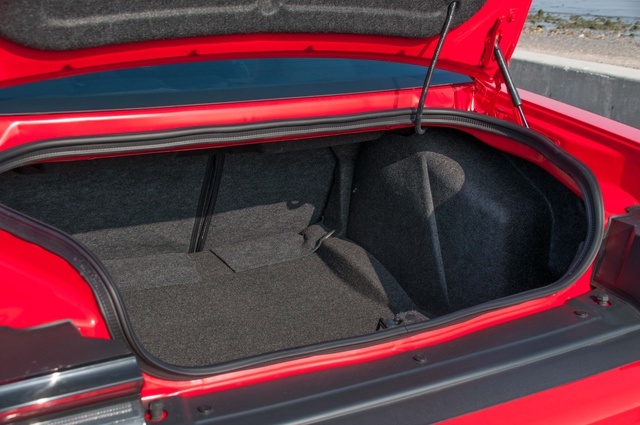 The trunk, however, is truly capacious with 16 cubic feet of space. Simplicity reigns inside the Challenger. The thick steering wheel has buttons for the central LCD screen and adaptive cruise control, plus it’s heated and switches on automatically with the driver’s seat when it’s cold. The speedometer and tachometer, with their red needles and tall, ultra-thin typefaces, mimic the warm vibes of a Fisher stereo receiver. If you don’t know what a Fisher stereo receiver is, you cannot fully understand the Challenger. Elsewhere, the Challenger is a digital machine. While basic stereo and climate controls are hard buttons and knobs, most of the car’s considerable functionality is backlit by a bright 8.4-inch touchscreen that’s probably the easiest-to-master infotainment system in the entire car industry. It’s fast, logical, and intuitive. The same goes for the central LCD screen and its nine menus of information. You’ll be up and running in no time. 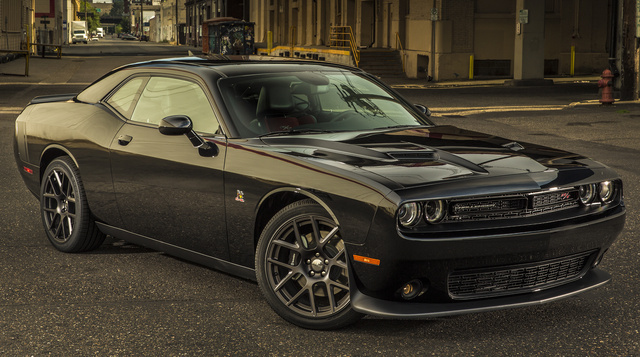 While the Challenger looks intimidating, its technology isn’t. 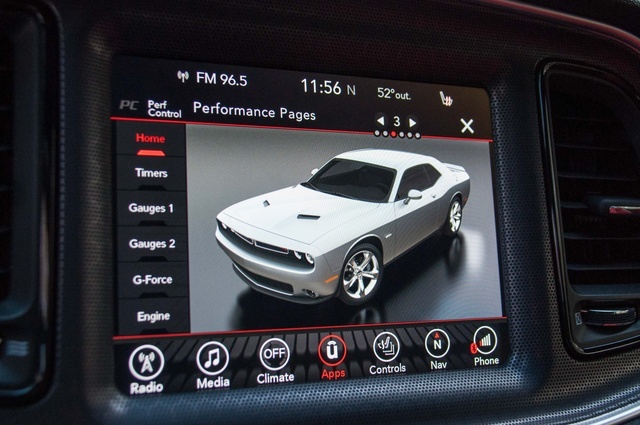 The Challenger’s user-friendly interfaces are truly exceptional in an age where car designers seem to forget we’re not thumbing their pretty screens in our living rooms. The Uconnect 8.4 system comes standard on the GT with navigation, real-time traffic, weather alerts, and onboard apps. The Performance Pages app shows everything the car is doing—from steering angle to exact torque, G-forces to quarter-mile times, and more. You can access most of this info in the central LCD and even call up the Challenger’s intake air temperature or oil pressure. It’s gratifying that Dodge allows the driver to access the car’s vitals instead of hiding them for service technicians. Just be sure to reset the maximum recorded speed in case anybody shouldn’t know. Our GT trim had every technology option you can throw on the Challenger, including the latest driver assists, auto high beams, and rain-sensing wipers. Dodge charges $1,195 for a sunroof, which strikes us as rather absurd when the GT already comes standard with LED daytime running lights, LED taillights, xenon headlights, and 19-inch alloy wheels. Remote start, passive entry with push-button start, a power tilt/telescope steering wheel, and cooled front seats are welcome luxuries. The optional $895 Harman Kardon stereo packs 18 speakers and Surround Sound. Trust us, it’s worth it. The 2017 Dodge Challenger got the highest 5-star overall rating from the National Highway Traffic Safety Administration (it scored 4 stars in the frontal crash rating). The Insurance Institute for Highway Safety, which runs different crash tests, scored the 2017 Challenger much lower. It received the highest Good rating in only the moderate front overlap and side crash tests; it scored Marginal on the small front overlap test and Acceptable on the roof strength and headrest/seat tests. The Challenger’s body structure was deemed Poor in the small front overlap test, which puts high stress on a car’s pillars and passenger cell. Remember, while Dodge has applied minor updates, the Challenger rides on a nine-year-old chassis based on an even older Mercedes design. The usual airbags are in place, and many driver-assist features are optional. Those include lane-departure warning, blind-spot monitoring, and forward-collision alert, the latter of which once erroneously flashed a “Brake!” message on the central screen on the highway without any obstacle present. A reversing camera is standard. 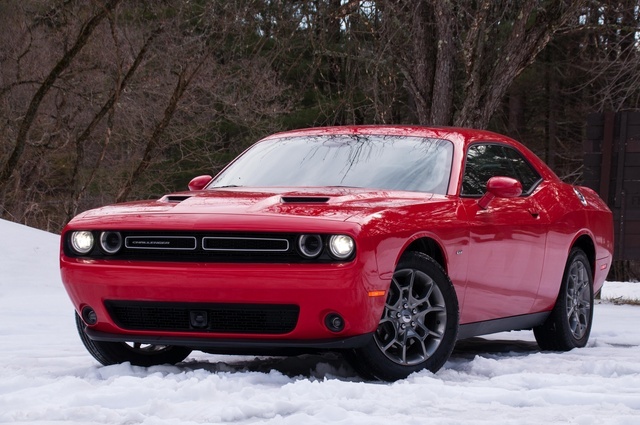 At $39,865, our Challenger GT was a fully loaded V6 model and represents a good value. 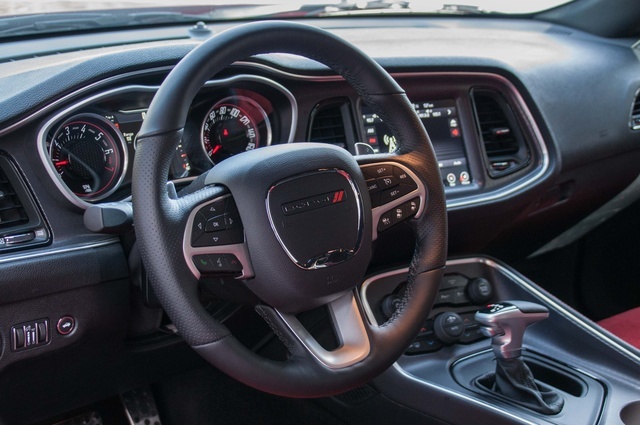 All of the 14 trims are priced right, with base prices ranging from $28,090 for the SXT to $65,290 for the Hellcat. The GT starts at $34,685 and with options is more expensive than the V8 R/T models. But with four engines, two transmissions, and the option for AWD—not to mention all the decals and M&M candy-color paint jobs—there’s lots of choice. Even though the Challenger looks like it did in 2008, steady improvements to powertrains, technology, and comfort have kept this throwback coupe competitive. What's your take on the 2017 Dodge Challenger? TheHorror Much better looking than the original Challenger, but not as awesome as the Challenger space shuttle. Have you driven a 2017 Dodge Challenger? I Just Purchased A 2017 Dodge Challenger For My Son.